1. music originating in New Orleans around the beginning of the 20th century and subsequently developing through various increasingly complex styles, generally marked by intricate, propulsive rhythms, polyphonic ensemble playing, improvisatory, virtuosic solos, melodic freedom, and a harmonic idiom ranging from simple diatonicism through chromaticism to atonality. 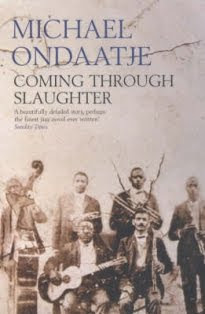 I recently finished Coming Through Slaughter by Canadian author Michael Ondaatje. At only 156 pages it was a bit of a tough read. The novel is a fictional story about a real life New Orleans jazz musician named Buddy Bolden. Set in 1907 the book is written like jazz is played – all over the place – so at times it was a bit hard to follow. Overall I found it a thoroughly enjoyable read and would recommend it to anyone, and if you are a fan of jazz music, all the better. Next on the list is Barney's Version by Mordecai Richler.